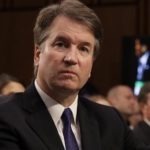 With the FBI having finally received the green light a few hours ago to conduct an unrestricted investigation into the sexual assault allegations against Brett Kavanaugh, we’re now learning that he’s been accused of having raped a woman in the back of a car. The Senate Judiciary Committee took this accusation seriously enough that it questioned Kavanaugh about it during private hearings – and the transcript just surfaced publicly. Brett Kavanaugh’s response, according to the transcript: “Nothing — the whole thing is ridiculous. Nothing ever — anything like that, nothing. I mean, that’s — the whole thing is just a crock, farce, wrong, didn’t happen, not anything close.” This interview took place six days ago, and the transcript was just released today. You can read the entire exchange starting on page thirteen.